For many of our clients, a phone call is worth seven to ten times more than a form fill. This means that we want to maximize the number of calls, but don’t want to completely shut down the forms on these sites. Phone calls are typically most valuable to businesses selling high-dollar and high-consideration products. The term “high-dollar” is subjective. It can mean anything from plastic surgery to mortgage loan applications. “High-consideration” products and services are those for which the stakes are high, and the buyer will generally do more research before buying. Cars, appliances, and vacations are some examples of considered purchases. Phone calls are also valuable in markets in which doing nothing is a real option. For example, addiction treatment centers will want to get a prospect on the phone knowing that they will want to delay treatment for their addiction. For these businesses, a human being will often have more success moving a prospect to a close than the website alone. When someone completes a form on the site, you know where the information goes. Someone gets an email. A record is added to the customer relationship management (CRM) system. Lead counts are tallied for your weekly marketing report. Some get contacted. Some don’t. Some get the autoresponder they had hoped for. Most don’t. Form leads too often wither in the CRM freezer. How can we thaw out our lead funnel and give sales what they need to generate revenue? Phone Calls. Because phone calls don’t get cold. Phone calls are answered and voice mails are returned. There is no CRM icebox where your contacts can be sent to chill while everyone updates their lead reports. Even if you have highly sophisticated marketing automation campaigns that move people through the sales funnel, none of them is as efficient and successful as a human being — listening, answering questions, and handling objections. In our experience, [pullquote]a phone call is worth between 500% and 1,000% (that’s five to ten times) more in revenue than a completed form will generate[/pullquote]. The business wants more calls. 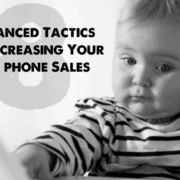 Your sales team wants more calls. However, marketing is rewarded for leads. This is the problem. There are three kinds of people coming to your website who need to talk to someone. They won’t be satisfied by completing a form or reading a report. Those who visit looking for a number to call. We want to make sure that they find the number they are looking for. Those who would call if incentivized. We want to make it attractive for them to pick up the phone. There is a group of those who just don’t want to talk to another human under any circumstances. We want these folks to complete the form. When you say, “Let’s put a phone number on our site because someone might actually call,” you are thinking of the first group, those who will call. This is not going to be effective for the second group, those who might call. Embrace the phone, or they will go someplace else. Evaluate the location of phone numbers on your site the same way you would evaluate call to action buttons. The phone number needs to be prominent, frequent, but not too pushy. Below we talk about where to place phone numbers. In order for this to work, dear marketer, you first need to get credit for these calls. Instead of slapping the company sales number on the website, you need to be able to measure calls sent from the site. Inexpensive services will give you a unique number. We use Grasshopper for our 800 number service. Google Voice is a source of local phone numbers. Counting calls will be largely done by hand. To tie calls back into an analytics package, we’ve worked with a number of services, including Dialogtech, FiveNines, Five9, Convirza, and Invoca. 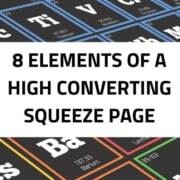 This allows you to calculate a conversion rate with more accuracy. 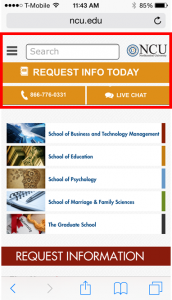 Watch our phone leads webinar with Convirza. The ways these packages work are different and beyond the scope of this column. Nonetheless, they let you take credit for real activity in sales. We too often think that those who would prefer a call will think of calling. It ain’t true. Someone predisposed to call still needs to understand why they should call and what to expect. The only number that doesn’t need a call-to-action is 9-1-1. Those who bother to write an invitation alongside their phone numbers resort to engaging messages such as, “Call,” “Call us,” “Call us today,” or the daring “Contact us.” None of these offers a why or tells you what to expect. Adding an exclamation point doesn’t help. Home Instead Senior Care is really working hard to get visitors to pick up the phone. Alignment means that your “call-to-call” mirrors the need of the visitor. 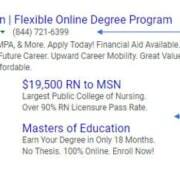 Often, it is sufficient to match the invitation in the ad or link what brought them to the page. Adding Emotion shows that you relate to their real non-logical pain or desire. In the example above, “Struggling with caring for a parent” would be aligned, but not emotional. The visitor wants Clarity about what will happen if they call. Who will be on the end of the line? Will they be an expert? Will they try to sell me or educate me? Can I call on weekends? Be clear about what will happen on the call. Finally, you must build the Value of the call. Like all good calls-to-action, the call-to-call must reek of WIIFM (“what’s in it for me”). It has to promise enough to the visitor that they would prefer to call you over any alternative. Lay it out there. These four components — Alignment, Emotion, Clarity and Value — make for effective calls-to-call, and are great for other calls-to-action as well. In the headline at the start of content. About 75% down a page of content. The following image shows a wireframe of a typical content page with proper placement of calls-to-call. We’ve tested them all over the page. On your small-screen mobile site — as opposed to your tablet-formatted website — click to call is an intuitive way to get more calls. [pullquote]For our call-oriented customers, their mobile sites now out-convert their desktop sites. [/pullquote] How do we do it? Here are some steps. 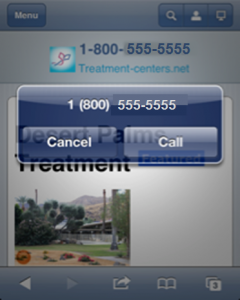 Click to call is crucial for mobile conversion rates. Sometimes, that’s all it takes. Write “Tel” links explicitly. This sticky header offers several ways to take action. You never know when the visitor will have the information they need to take action. Plus, they may find it’s their turn in line and need to take action quickly. These are mobile devices, you know. Completing forms on a mobile device is grueling, frustrating and could scare the children. Look for ways to take action that don’t require long forms to fill. 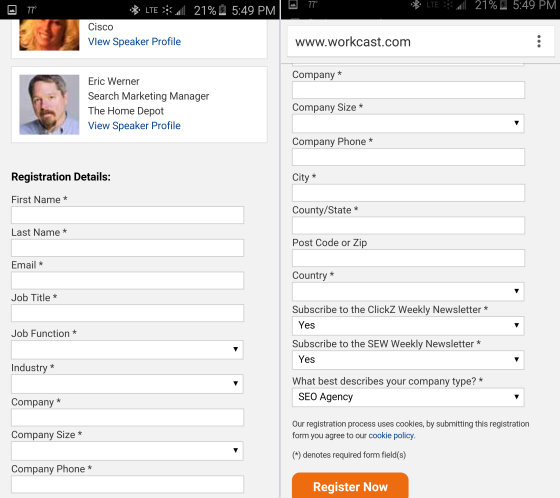 Ironically, this two-screen form is for a Webinar on mobile marketing. Consider using auto-fill from a social network, like LinkedIn or Facebook. Filling in forms on mobile is hard. Consider social login auto-fill. To maximize the number of calls you get and cast fewer of your visitors into the frigid desert of the CRM, make your forms long, and ask for some personal info. Yes, this is the opposite of what we tell you to do when you want visitors to fill out a form. This will cook your noodle. When trying to maximize the number of calls we get, a long, nasty form works better than no form at all. That’s right. No form generates fewer calls. I think this highlights the way our visitors assign a price to their time and attention. On its own, a phone call may seem “expensive”. However, when a long, nasty form is on the page, it makes the cost of taking action by form more “expensive”. The call looks cheap by comparison. This is a pricing exercise, but the cost isn’t money. It’s time and attention. This article first appeared on Marketing Land. I’ve often seen the sticky headers or footers for navigation but never considered them for a click-to-call. I’ll definitely be testing this! Great article! Brandon, we have consistent luck with this tactic. What varies is what you put in the header or footer. Great article! It’s definitely easier to commute information over the phone than the internet. You can’t really convey emotion or stress a certain statement to someone as well. I might suggest some of this to my boss! I’ll bet on a human over a form any day. It’s a huge missed opportunity for so may websites.